Below is a list of our Sponsorship Opportunities for Breast Cancer Diaries – The Play debuting October 5, 2019. Please contact us to discuss your tax deductible donation today! Thank you in advance for your support of our mission to help provide educational programs, supportive services, and life-enriching activities to women with cancer. 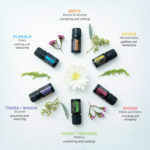 Cancer Tamer Foundation is a 501(c)(3) organization; your generous donation will be tax deductible. Please contact us to discuss your participation and to answer any questions. Discount tickets on sale for a limited time. VIP/Cast Party includes: Play, DJ party, cash bar, special goodie bags and more! You can also purchase ticket(s) to be donated to cancer patients. 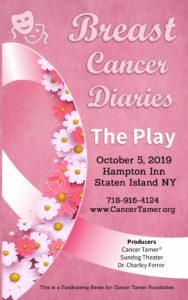 Breast Cancer Diaries – The Play is made possible (in part) by a DCA Premier Grant from Staten Island Arts, with public funding from the New York City Department of Cultural Affairs.